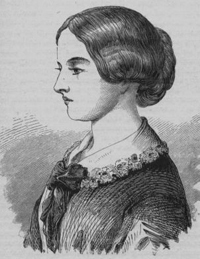 Although Florence Nightingale is famous as a nurse, the main tool she used in her campaign to reform hospitals was statistics. Nightingale had been shocked by the conditions she'd found in the military hospitals in Turkey: there were no blankets, beds, furniture, food, or cooking utensils, and there were rats and fleas everywhere. Nightingale was unhappy about the appalling lack of cleanliness and hygiene, but also about the fact that no one had properly organised the medical records. Even the number of deaths was not accurate; hundreds of men had been buried, but their deaths were not recorded. Read a longer version of this article by Eileen Magnello! Example of a polar area diagram. Such a diagram is cut into twelve equal angles, with each slice representing one month of the year. Each colour represents a cause of death and the area of each coloured wedge, measured from the centre, is in proportion to the number of soldiers that died from that cause — so the larger the wedge, the more soldiers died. 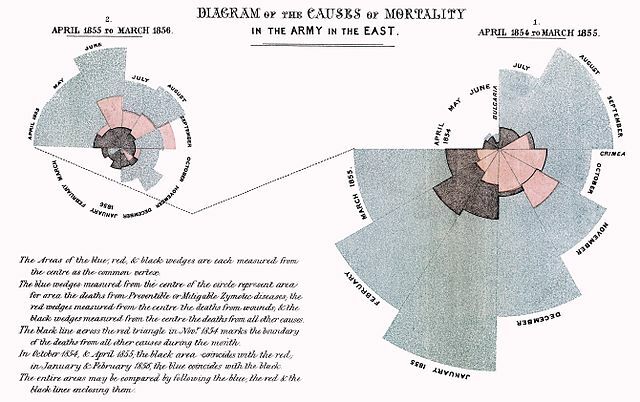 The blue outer wedges represent the deaths from contagious diseases, such as cholera and typhus. The central red wedges show the deaths from wounds. The black wedges in between represent deaths from all other causes. This article is based on The compassionate statistician by Eileen Magnello.